Introduction to Shigeru Mizuki. 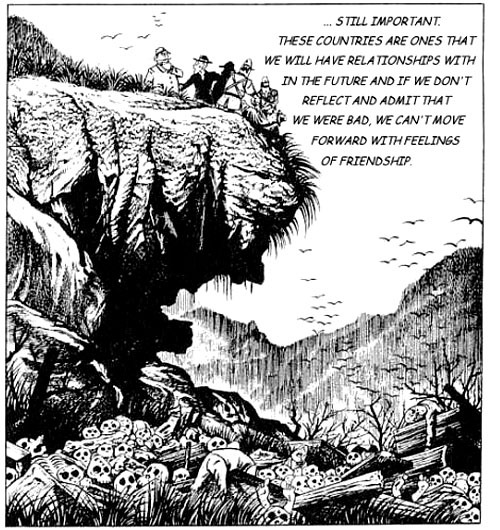 Matthew Penney has written a primer on the great Japanese mangaka, accompanied by a short and didactic, but touching comic on Japan’s wars in Southeast Asia (I think I got this from Dirk). Also, read the Bunker review of his great Nonnonba. Isbjerg remixes hip hop classics. Retired Danish MC Isbjerg has taken to homegrown remixing, and his work is pretty fun. Check out his hypothetical 1988 version of El-P’s masterful I’ll Sleep When You’re Dead, for example. Information: “Lad idioterne nakke hinanden” (for our Danish readers). This is a bit old, but is well-written and delightfully sarcastic commentary on the current wild west gang war tendencies in Copenhagen by author Morten Vammen.